Ten days ago, SDAFF’s Opening Night film, the Korean film Little Forest, featured the thematic device of food as a means for the young female chef-tagonist Hye-won to learn about her past relationship with her dead father and the mother who abandoned her as well as a way to reconnect with old friends as they discuss their failures and triumphs over savory home-cooked meals prepared by Hye-won. Last night’s purposely placed similar slice of life Closing Night film, Ramen Shop, revisits the culinary arts theme on a wider familial and cultural scale thus completing the perfect, ultimate festival deli sandwich. Directed by Eric Khoo, Ramen Shop features a similar aged, yet male, chef-tagonist Masato (Takumi Saito), half Japanese and half Singaporean Chinese, who after his dad Kazuo’s recent passing, in part due to a broken heart as a result of his mum Mei Lian’s death, drops everything and returns to where he was born and raised in Singapore to reconnect with his parents’ past and learn how to create the perfect ramen-bak kut teh (pork rib soup; Mandarin: rou gu cha – meat bone tea) fusion and serve it in Japan. Yet upon his arrival he additionally pines to understand why in his mother’s diary, when she was dying, she wrote that she wanted to reconcile with Masato’s grandmother and that it was his mum’s hope that she could replace the pencil drawing of the family depicted in the diary with a real photo. Though adept in preparing food, is Masato prepared to learn the truth? When he hooks up with his mum’s brother, uncle Wee, who runs the family bak kut teh joint, they hit it off as Wee feels the kid’s pain and angst so apart from sharing the family recipe, he dares to introduce Masato to the grandmother…a move that backfired more than the sinking of the Titanic. The hate that oozed from the grandmother was scary to Masato and he couldn’t for the life of him figure out why, until he took a trip to the local Singaporean Museum of War History, a scene subliminally set up earlier in the film. The reason why Masato was rejected by his Chinese grandmother is because she couldn’t forgive her daughter for marrying a Japanese man, which then made Masato Japanese. In the war museum, he learns about the deep-rooted resentment of many Singaporeans in regard to how they were viciously mistreated by the Japanese soldiers during Japan’s World War II occupation of Singapore, which even today the Japanese government has as of yet made no official admittance of guilt or apology for their atrocities. When during an interview with thedivareview.com, it was noted to Saito that it could have been controversial for a Japanese actor to do the war museum scene, thus he was asked if had any hesitation about those moments and how they might play in the eyes of the Japanese public. Saito shared, “The Japanese people don’t know the history…and me, too. I read the script, and was surprised. It was too shocking. Older Singaporeans from that time know the history but we don’t know. Many Japanese go to Singapore for sightseeing, take photos, eat something and go back to Japan. Like me, they don’t know the history. As it were, the film’s real point-of-no-return is when Masato meets the maternal grandmother and now the power of the food becomes the hero’s mentor to initiate change in the hero’s journey. It gives Masato a rebirth of sorts, the revelation of perfecting that ramen-pork rib tea puzzle, a reward that not only transforms him but also his grandmother. They move beyond the history repeating itself motif curse on a personal level, where it is the power of food that erases the hate, opens the heart and they shall be resurrected. Their return to living life could never have been so tasty. 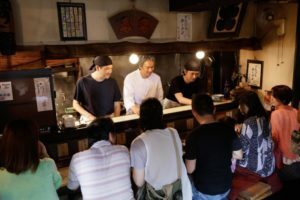 So I end this final SDAFF 2018 blog with respectful cheer to all male noodle cooks everywhere…Rah Men! Rah Men! Rah Men!